Cinnamon Supplement - Enjoy the Benefits of Cinnamon in a Tasty Smoothie! Enjoy the Benefits of Cinnamon in a Tasty Smoothie! Cinnamon supplement has become very popular. It is inexpensive, safe, and with proven health benefits. Most people who use cinnamon take cinnamon capsules. A more effective way to enjoy the health benefits of cinnamon nutrition, however, is to add the right kind of cinnamon to your smoothies or to drink as a tea. What Kind of Cinnamon is Best? If you have ever looked at different kinds of cinnamon available in bulk, you have probably noticed that one kind of cinnamon supplement is a dark brown, while the other is more of a tan. The two kinds of cinnamon are actually from different plants. Cinnamomum Cassia, used in curry powder and in Chinese and Korean dishes, is dark brown. The other variety of cinnamon, Cinnamomum Zeylanicum, is a lighter brown or tan. I prefer to use Cinnamomum Zeylanicum for long-term supplementation. - Fasting glucose was lowered 18 to 29 per cent. For most diabetics, this would be something in the range of 30-50 mg/dl, or 1-2.5 mM. - LDL, or "bad," cholesterol fell by 7 to 27 per cent. - Total cholesterol fell 12 to 26 per cent without any loss of the protective HDL cholesterol. - Fasting triglycerides fell 23 to 30 per cent. The benefits of the cinnamon supplement continued even after supplementation stopped. That means... if you used cinnamon on a daily basis, you do not necessarily need cinnamon every day to receive the full benefits of cinnamon for blood sugar regulation and lowered levels of LDL, cholesterol, and triglycerides. In the interest of full disclosure, however, it is crucial to note that one recent study did not find the benefits of cinnamon to accrue in just 14 days. It is apparently necessary to use cinnamon in food for at least 40 days before you can "take a day off" and still get the protective benefits. At least 52 studies have looked at various aspects of cinnamon and blood sugar regulation since the publication of the Pakistani study in 2003. Much of the criticism of cinnamon has been based on the entirely factual assertion that cinnamon alone is not enough for "tight control" of full-blown diabetes. 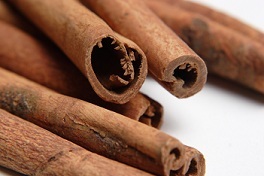 For diabetics, cinnamon should be apart of a mixture of different avenues of treatment. Like changing the diet and exercising on a regular basis. People who take medications, like insulin and blood thinners, need to consult with their doctor before taking large amounts of cinnamon. More cinnamon is not necessarily better. The optimum dose is between 1-3 grams a day. 1 gram is around 1/4 teaspoon of ground cinnamon, about the amount you would use in a single-serving smoothie. Most smoothie recipes suggest adding cinnamon "to taste," but a good place to begin is with 1/2 teaspoon of ground cinnamon for every 2 cups of smoothie. Adding cinnamon before blending maximizes aroma and flavor. But you can always sprinkle more on top as a garnish to impress your family and friends. Brewing up tea with cinnamon and using that as the liquid of the smoothie is tasty as well. Just make sure to chill the tea prior to blending. If you are interested in saving money, I recommend that you buy your cinnamon in bulk amounts. 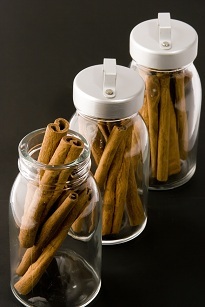 Make sure to store your extra cinnamon in a closed container for optimum freshness. Well... I hope that you found this spicy article helpful to you. -Jitomir J, Willoughby DS. Cassia cinnamon for the attenuation of glucose intolerance and insulin resistance resulting from sleep loss. J Med Food. 2009 Jun;12(3):467-72. Review. -Kirkham S, Akilen R, Sharma S, Tsiami A. The potential of cinnamon to reduce blood glucose levels in patients with type 2 diabetes and insulin resistance. Diabetes Obes Metab. 2009 Dec;11(12):1100-13. -Solomon TP, Blannin AK. Changes in glucose tolerance and insulin sensitivity following 2 weeks of daily cinnamon ingestion in healthy humans. Eur J Appl Physiol. 2009 Apr;105(6):969-76. Epub 2009 Jan 22.